Burton Albion manager Nigel Clough has challenged his players to be "mentally tough enough" to turn around their poor home form as they seek a route out of the Championship relegation zone. Burton have taken just eight points from 15 home matches and host out-of-form Nottingham Forest on Saturday. Away from home, the Brewers have won four and drawn five, including a 0-0 draw at Ipswich on 10 February. 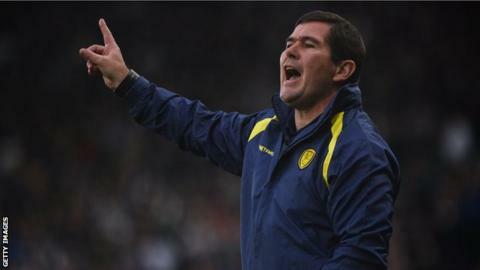 "We just say to the players 'go out and play the same way'," said Clough. "They have to be mentally strong enough to do that. Away from home it is easier in some ways because you don't have that pressure with the onus being on you." Bottom club Burton are four points from safety with 15 league matches left to play. They claimed a point at Portman Road having lost their previous five matches in all competitions, and have not won at home since 16 September. "I think irrespective of what's happened in recent games, we have to try to take the initiative and have a go on Saturday," Clough told BBC Radio Derby. "We haven't got a lot to lose, people are thinking that we're down and I've said to the players we may as well relax, go out and have a go."